I used to see bears fairly often where I grew up in the interior of British Columbia. Once, as a kid, I had to call my dad to come and get me as I was riding my bike home and a black bear would not move out of the road. I was too much of a chicken to pedal past him. Unfortunately I have not seen one single bear since I moved to Cape Breton. 13 years and NO BEARS!! I know they are here because at least a few times in the summer a visitor to my shop tells me they “just saw a bear right down the road”. 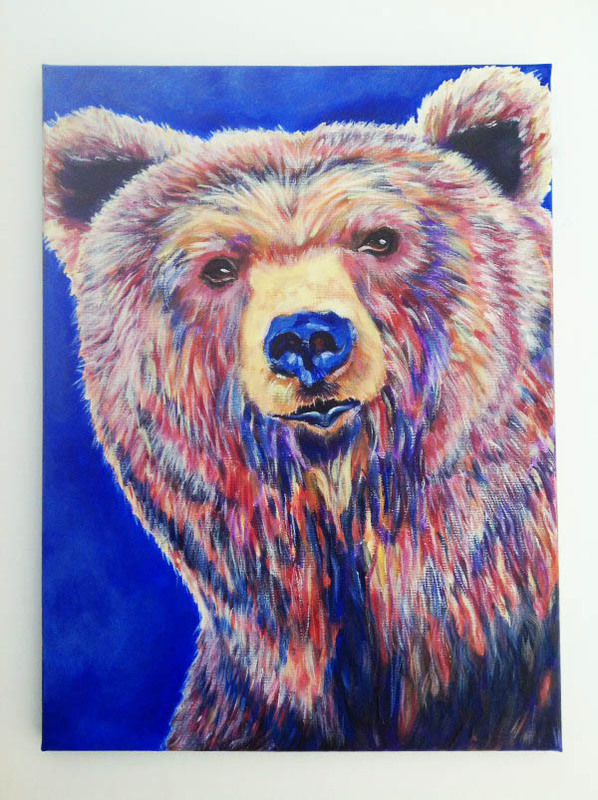 So, missing the bears, I thought I’d try my hand at painting one. I think he is an inquisitive bear. He kind of got tiger-ish for a while, as you can see in the second photo, but as with my larger clay sculptures, there seems to be an awkward stage where everything feels like it will never go right and I want to pitch them off a cliff and then suddenly I find myself back on track. When I started taking these sequential photos of the paintings in progress it was so I could send my parents a little snapshot of the process. We live on opposite sides of the country but they like to see what I am up to. Mum and I sometimes send each other photos of our new pieces of pottery, or new glazes. She said she really liked seeing how the painting changed each time I sent a photo. So, being someone who is also fascinated by the “maker process”, I thought it would be good to share the photos here for those with similar interests. Here is a print of the bear, with a little twist. You can’t tell from the photos, but in the original his ears wrap around the sides of the canvas. When I wanted his ears peeking through the mat it meant I had to scan the sides of the canvas and then “stitch” them onto the image in photoshop so that the full ears were there. 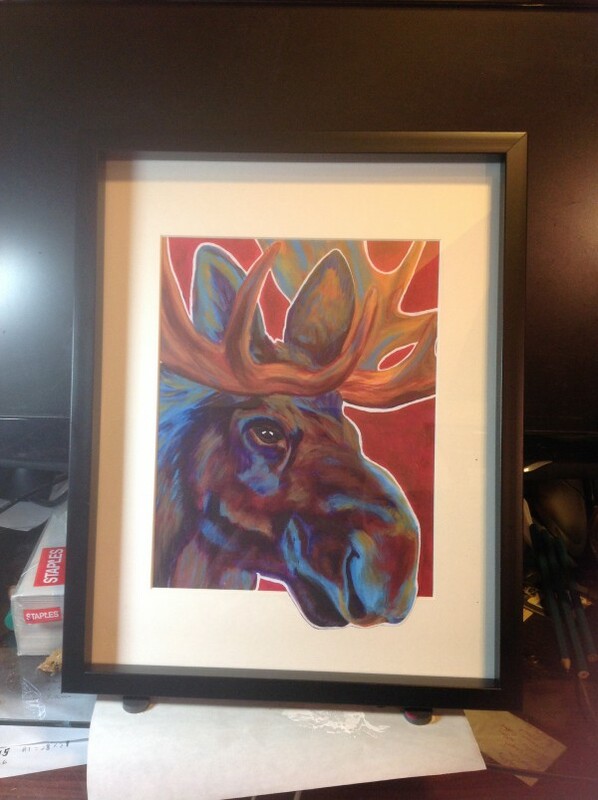 I hadn’t planned to do that when I painted him, but when I saw how it looked with the moose I had done previously, I thought it would be fun to have a series of these inquisitive visitors poking their heads through. In the last post I mentioned feeling nervous about sharing my paintings. I had such positive and encouraging responses from people that made me feel so loved. Thank-you!! PS, I wrote this before leaving for Europe to walk again on The Camino de Santiago. 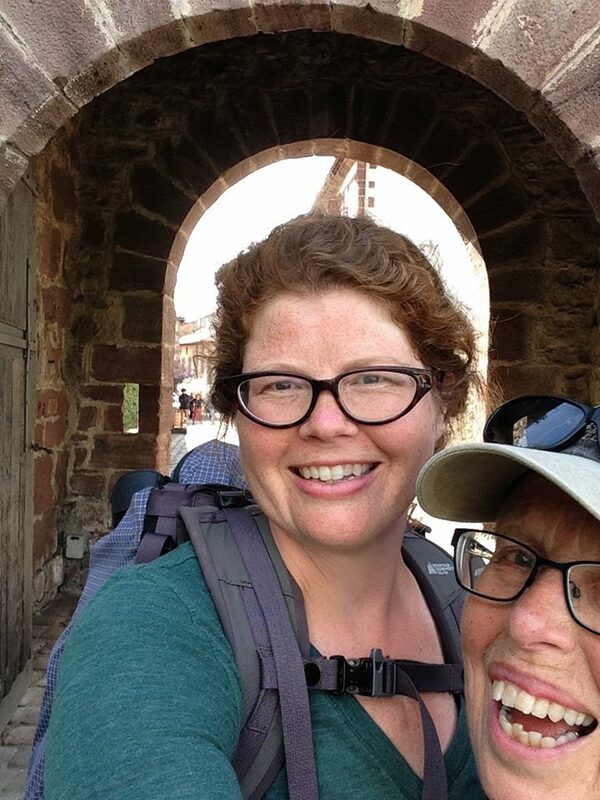 My mum and I walked from Moissac, France to Pamplona Spain. Roughly 400 km. It was hard and wonderful and HOT, and another great adventure. Now I am in the pottery studio and trying to get enough stock made so that I can open for the season. Painting is on hold for a bit, but I’ve got one waiting for me that was started before I left, so I think I’ll be back at it soon enough! Here’s a mother-daughter photo from St Jean Pied de Port on the French side of the Pyrenees. Happy Mother’s Day to my best Camino friend.